1930’s Gross Domestic Product (GDP), which measures human progress by income only, is invented in response to the economic depression, before we knew about issues like climate change or the importance of counting social progress in measuring a country’s overall wealth and prosperity. 2006 The New Economics Foundation launches the Happy Planet Index, one of the first efforts to compliment GDP by factoring societal and environmental health into measuring prosperity. 2008 The 2008 Global Financial Crisis, from which most countries are still recovering, raises further questions for the epistemic community about measuring only income as a metric for human progress. July 19, 2011 The Kingdom of Bhutan, which has been measuring “Gross National Happiness” since 1970, officially elevates happiness as a fundamental human right and goal. Then-Prime Minister Jigmi Thinley of Bhutan and Ambassador of Bhutan to the United Nations Lhatu Wangchuk led an initiative to draft and successfully campaign for the adoption of UN Resolution 65/309, Happiness: towards a holistic approach to development. 2011 Illien Group Inc., the social impact investment pillar of the Illien Global Public Benefit Corporation, launches a $1.5MM initiative to advance happiness as a human right and universal goal to the top of the international policy agenda by drafting UN Resolution 66/281 and campaigning to gain the support of all 193 Member States, as well as UN Secretary-General Ban Ki-moon, to create the International Day of Happiness. April 1, 2012 The first ever World Happiness Report, edited by John Helliwell, Richard Layard, and Jeffrey Sachs is released. June 28, 2012 UN Resolution 66/281 ADOPTED! June 28, 2012 UN Resolution 66/281: International Day of Happiness is adopted by all 193 UN Member States, making March 20th the International Day of Happiness, forever! September 9, 2013 The second World Happiness Report, edited by John Helliwell, Richard Layard, and Jeffrey Sachs is released. 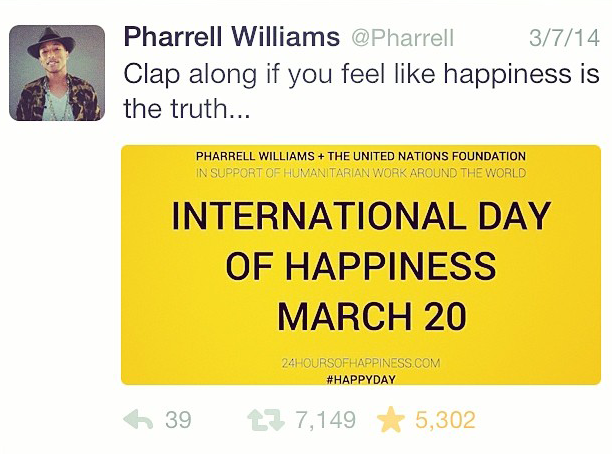 March 20, 2014 The second International Day of Happiness celebration is led by Pharrell Williams and the United Nations Foundation, who partnered to launch a 24-hour music video campaign surrounding Pharrell’s hit record, “Happy,” inspiring youth in countries as far as Yemen and Iran to participate. March 20, 2015 The third International Day of Happiness celebration is led again by Pharrell Williams, who addressed the youth from the UN General Assembly with an important message: “Happiness is your birthright.” Perhaps the most historic moment of the 2015 Happiness Day celebration was when United Nations Secretary-General Ban Ki-moon said, “Happiness for the entire human family is one of the main goals of the United Nations.” The Secretary-General’s comments could not have been more timely, coming just six months before UN adopts the Global Goals for Sustainable Development. April 23, 2015 The third World Happiness Report, edited by John Helliwell, Richard Layard, and Jeffrey Sachs is released. September 25, 2015 The United Nations fully commits to advancing happiness as a fundamental human right and universal goal when the largest-ever gathering of global leaders meets at the 70th anniversary of the UN General Assembly to adopt the Global Goals for Sustainable Development, thus paving the next fifteen years of the path to happiness for all. ©2011-2018 Happiness Day. All Rights Reserved.